Sulfur: Mineral, Native Element, Nutrient. Its uses and properties. Chemical element. Native mineral. Essential to all living things. Sulfur terminal: Piles of yellow sulfur at a terminal near Vancouver, British Columbia, Canada. The sulfur is brought by rail from oil and natural gas processing facilities in the Province of Alberta. At this terminal it is loaded onto barges and ships for bulk transport. Photo copyright iStockphoto / teekaygee. Sulfur fumarole: As hot volcanic gases, rich in sulfur, escape from a volcanic vent, the gases cool and sulfur is deposited as yellow crystals around the vent. 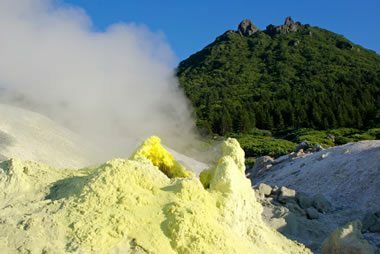 This fumarole on the island of Kunashir (in the Kuril Islands, northeast of the Japanese island of Hokkaido) has a significant accumulation of bright yellow sulfur. Photo copyright iStockphoto / Sergey Dubrovskiy. Did You Know? Many strong odors are produced by sulfur compounds. The smell of skunks, matches, garlic, grapefruit, and rotten eggs are caused by sulfur. Image copyright iStockphoto / Florintt, Gio_banfi, Abomb Industries Design, ivelly, and Big_Ryan. Sulfur is a chemical element with an atomic number of 16 and an atomic symbol of S. At room temperature it is a yellow crystalline solid. Even though it is insoluble in water, it is one of the most versatile elements at forming compounds. Sulfur reacts and forms compounds with all elements except gold, iodine, iridium, nitrogen, platinum, tellurium, and the inert gases. Sulfur is abundant and occurs throughout the Universe, but it is rarely found in a pure, uncombined form at Earth's surface. As an element, sulfur is an important constituent of sulfate and sulfide minerals. It occurs in the dissolved ions of many waters. It is an important constituent of many atmospheric, subsurface, and dissolved gases. It is an essential element in all living things and is in the organic molecules of all fossil fuels. Did You Know? The Chinese discovered sulfur in about 2000 BC, used it to make gunpowder in the 7th century, and used gunpowder to launch rockets, shoot projectiles, and make hand grenades in the 10th century. Color Yellow. Brownish yellow to greenish yellow. Red when molten at over 200 degrees Celsius. 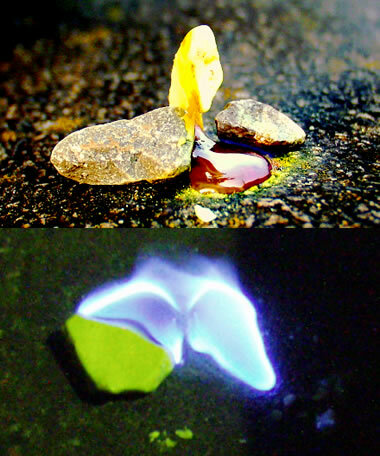 Burns with a flame that can be difficult to see in daylight but is blue in the dark. Luster Crystals are resinous to greasy. Powdered sulfur is dull or earthy. Uses About 90% is used to manufacture sulfuric acid. The remainder is used in a variety of products that include hydrogen sulfide, insecticides, herbicides, fungicides, pharmaceuticals, soaps, textiles, papers, processed rubber, gunpowder, leather, paint, dyes, food preservatives. Sulfur is Abundant and Everywhere! The information below should convince you that sulfur is extremely abundant and present everywhere. Sulfur Crystals: Bright yellow sulfur crystal group showing the mineral's characteristic orthorhombic crystal form and resinous luster. Specimen measures approximately 7.3 x 6.6 x 5.3 centimeters in size and was collected from the Agrigento Province, Sicily, Italy. Specimen and photo by Arkenstone / www.iRocks.com. Burning sulfur: Pieces of sulfur burning in daylight and in the dark. Photo by Johannes 'volty' Hemmerlein, used here under a GNU Free Documentation License. Did You Know? Jupiter's moon, Io, has over 400 active volcanoes that emit enormous amounts of sulfur - so much sulfur that the moon has a yellowish color. The name "sulphur" has been used in the United Kingdom and throughout the British Empire for hundreds of years. "Sulfur" is the spelling used in common and scientific communication in the United States. In 1990 the International Union of Pure and Applied Chemistry designated "sulfur" as the preferred spelling. How the word is spelled can often reveal the age and origin of publications and authors. What Elements Are Found in the Human Body? Article in the Building Blocks of Life section of the Arizona School of Life Sciences website, accessed November 2016. Periodic Table of Elements in the Ocean, article on the Monterey Bay Aquarium Research Institute website, accessed November 2016. List of Periodic Table Elements Sorted by Abundance in Earth's Crust, article on the Israel Science and Technology website, accessed November 2016. The Composition of the Earth, by William F. McDonough, Chapter 1 in Earthquake Thermodynamics and Phase Transformations in the Earth’s Interior, manuscript on the Massachusetts Institute of Technology website, accessed November 2016. Solar System Abundances and Condensation Temperatures of the Elements by Katharina Lodders, article published on The Astrophysical Journal website, accessed November 2016. Abundance in the Universe of the Elements, article on the PeriodicTable.com website, accessed November 2016. Sulfur, by Lori E. Apodaca, United States Geological Survey, Mineral Commodity Summaries, 2016. 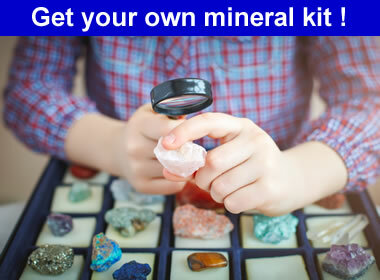 The International Mineralogical Association Database of Mineral Properties, an online database of minerals along with their chemical and physical properties that can be queried and sorted by anyone with internet access. 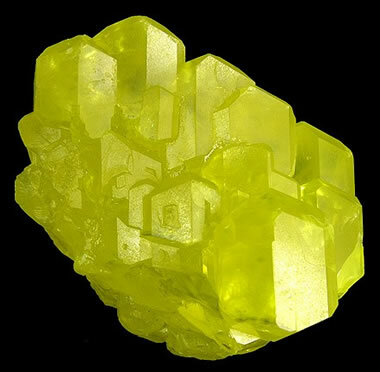 As a mineral, sulfur is a bright yellow crystalline material. It forms near volcanic vents and fumaroles, where it sublimates from a stream of hot gases. Small amounts of native sulfur also form during the weathering of sulfate and sulfide minerals. The largest accumulations of mineral sulfur are found in the subsurface. Many of these are in fractures and cavities associated with sulfide ore mineralization. The largest are associated with evaporite minerals, where gypsum and anhydrite yield native sulfur as a product of bacterial action. Significant amounts of sulfur have been produced from the cap rock of salt domes but this type of production is rarely done today. According to the International Mineralogical Association's database, over 1000 minerals contain sulfur as an essential part of their composition. This is a result of sulfur's ability to form compounds with all but a few other elements. The tables below list a small number of sulfide, sulfarsenide, sulfosalt and sulfate minerals. Many of the most common sulfur minerals are included in the list, but the list is not intended to be complete.